One of the more remarkable advances in neuroscience, perhaps on par with Santiago Ramon y Cajal’s Neuron Doctrine (the theory that distinct neurons are the functional units of the brain), is the discovery of microglia — appropriately by Cajal’s student Pio del Rio Hortega. Since their discovery, microglia have been the center of controversy in many contexts (i.e. ontogeny, neurodevelopment, synaptic plasticity, disease, etc.). This is not an overstatement. For example, Hortega surmised (correctly), back in the 1920s, that these cells hailed from the mesoderm, rather than the neuroectoderm (like all other brain cells) during an organism’s development. This prediction, however, was not definitively verified until seven decades later, when it was demonstrated that microglia do not populate the neuroectoderm until embryonic day eight. This insight generated further questions, including: from where do these alien cells specifically originate? This question of microglial ontogeny and other definitions will be the focus of Part I of a five part series on the role of microglia in brain function from development to disease, as potential therapeutic targets and culminating with a fun — possibly unexpected — look at futuristic directions. First, let us define some important terms. Unfortunately, many contemporary authors continue to use antiquated terminology when discussing microglia and this has become somewhat debilitating to the field (not to mention a pet peeve of mine). In 1908, Elie Metchnikoff won the Nobel Prize for his work on phagocytosis, or “cellular act of eating,” which later lead to his description of the macrophage system. This system is made up of cells collectively called mononuclear phagocytes, resulting in what is now called the mononuclear phagocyte system. 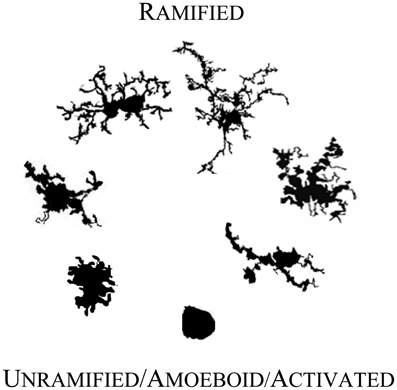 It is this classification to which the microglial cell fits. Microglia are, after all, the tissue resident phagocytic cells of the brain. Now, for the purpose of this article, I would like to define two more classification terms: “circulating” monocytes and “tissue-resident” macrophages. This distinction is important developmentally. It was recently demonstrated that circulating and tissue-resident cells arise from temporally and spatially different stem cell pools. For example, nearly all of our organs contain macrophages specifically designed to function within that organ, mainly performing maintenance duty. These tissue-resident macrophages derive from a developmental organ known as the yolk sac (most anatomists might call it an umbilical vesicle now), which is the sight of primitive hematopoeisis (or blood production). In other words, macrophages designed to function in a specific tissue are made first from a special pool of hematopoeitic stem cells and then leave the yolk sac to colonize their respective organs — such as microglia in the brain, Langerhans cells in the skin, or Kupfer cells in the liver. On the other hand, circulating monocytes are produced in the bone marrow later on in development, have a high turn over rate, and are continually produced over a lifetime. These cells mostly meander through the blood and lymphatic system and usually die after becoming activated — not necessarily so for tissue-resident macrophages. So, it was shown in 2011 in the journal Science for the first time, that microglial ontogeny begins in the yolk sac. From there, they travel through the newly developed blood stream to reach the brain before the aptly named blood brain barrier closes — forever shunning the entry of any other type of mononuclear phagocyte. Here they spend the rest of their lives actively surveying surrounding brain tissue (among other roles to be discussed in following articles), providing a homeostatic milieu for the brain to function efficiently. This brings us to our last set of definitions: surveillance, primed, activated and dystrophic microglia. I will not go deeply into each category, but I think it is important to understand that microglia are the most dynamic cells in the brain with their unique ability to transition between these activation states. I would also like to emphasize that these states are contextual and do not necessarily describe a microglial cell as beneficial or destructive to surrounding brain tissue, but instead are responses to molecular cues necessitating some microglial effector function. For example, a microglial cell can be activated in both developmental synapse pruning (beneficial) and phagocytosis of viable neurons during disease (detrimental). No matter what, microglia are never resting — a term that has also deluded the field — but in constant motion within defined, non-overlapping locales. You can find a live video I have taken of a retinal microglia in this state here. Instead of “resting” microglia, they are more appropriately termed surveillance microglia, as they extend and retract their processes, feeling around the adjacent tissue, sensing the environment. Primed microglia describes the state between surveillance and activation. One could think of it as a pre-activation state, where they begin showing signs of morphological changes (i.e. shortening and thickening of their processes) and expression of certain molecules. From there, microglia become fully activated, taking on a rounded (amoeboid) shape and expressing high levels of molecules associated with inflammation and/or phagocytosis. Lastly, dystrophic describes a dysfunctional state of microglia, in which their processes begin to fragment or even fuse with other microglia. This is usually associated with chronic activation during disease and not usually part of their functional spectrum. These definitions are currently in a state of flux as the field tries to develop a cohesive theory of microglial function. When looking at a fluorescent image of a mature, surveying microglia, one will notice how elegantly their processes radiate from the small cell body, forming complex, arborous structures. This is not their perpetual morphologic state. On the contrary, they are born as small, amorphous blobs, reminiscent of peripheral macrophages. In fact, their morphological development is the reverse of their transition through activation states. It is not until they enter the developing brain that they begin to ramify. Once they enter, microglia spread out to evenly tile the entire brain, taking up their positions as noble sentinels. Research is ongoing to determine what molecular cues developing microglia receive (and from where, but probably the brain) to drive their migration into the brain. A few candidate molecules (e.g. CSF-1, IL-34, TGF-beta; no need to memorize these) have been implicated. It can be imagined that as microglia develop from primitive macrophages in the yolk sac, such molecules would create a signaling gradient that microglia, expressing corresponding receptors, would follow to reach their final desination. Think of leaving a trail of biscuits for your stubborn puppy to follow if you want to get her into the kennel. Once they enter the brain, what keeps them there and in that complex, ramified morphology? What induces them to clear developmentally apoptotic neurons and prune synapses, both to allow appropriate, efficient wiring of the brain? Again, we think we have some ideas, but the precise molecular mechanisms remain unclear. What is clear, however, is that this area of microglial research is still blossoming and constant strides are being made to understand the development of these frenetic little cells. This could lead us to some interesting insights that will facilitate therapies for diseases where microglia seem to have a role; a topic we will cover in Part III of this series. Now that we have an idea of microglial ontogeny, we will next discuss what role they play in the healthy developing and adult brain in Part II of Microglia. Image via Johan Swanepoel / Shutterstock.